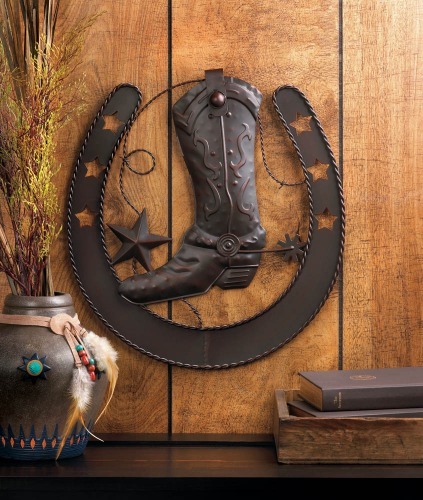 Country Star Boot Western Wall Decoration. It's time to decorate you room western style theme, make it pop in country. Wall decoration is a work of art that you have to have for your room. Every thing must and have to be bigger with a Texas boot style country twist. Give your friends and family a big welcome with this striking iron wall decor. Add some Western style to your wall with this cool cast-iron cowboy decor. A classic cowboy boot with spur rests inside a large horseshoe, surrounded by stars and a little bit of barb wire. This would make the perfect gift family and friends. Imagine this gift in a office or home or resort. Dimensions 14.2" x 0" x 15.8".